Well, when the babies are born, and you can see videos of them on our website and on YouTube, they will immediately go onto the sides of the parents. This is because they’re grazing off the body slime of the parents for their initial nutrition. There comes a point in time, however; probably two or three weeks after they’re born, that every time you feed the parents the babies start to break away and go down to get at the food. When they start to eat on their own, it’s a good indicator that they are ready to be moved out of the tank. At first only a couple will break off to go for the food, but eventually, they all will. That tells you that they are ready a fend for themselves. A big reason it is important to remove the babies when they get to this stage is that we want to give the parents a break. Let’s face it, these little guys are growing teeth now, and with 200 of them eating on the parent’s body slime, it can take a toll. In most circumstances, I will pull the parents out of the tank first because they are extremely aggressive and protective of their babies. 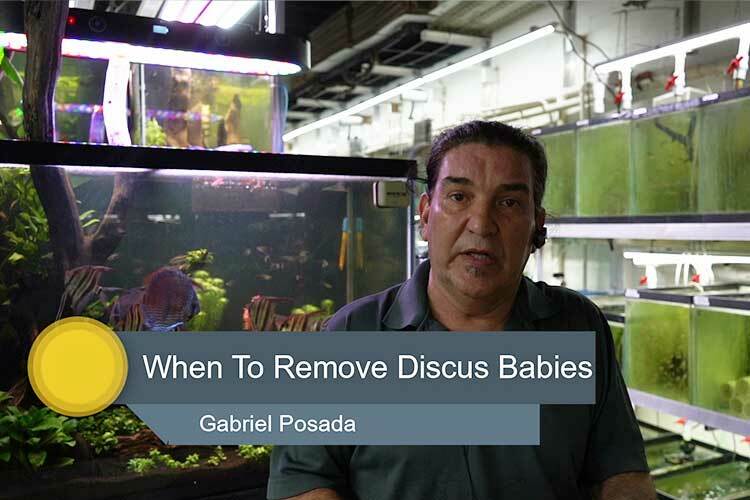 If you try to take the baby discus out first, the parents will charge into the net and squish all the babies on accident, thinking they are protecting them. They don’t realize that they’re hurting them, but they’re acting out of fear. What we do is isolate the breeding pair, and you can put them in a bucket or another temporary holding area for the time being. Keep in mind that if you transfer the breeding pair into another tank where there are already other fish, the pair are going to beat the snot out of the other fish. After the pair is separated and out of the tank you can start scooping up the babies and moving them to that grow out section that we showed you a couple of months ago. This is where we will allow them to grow out. Within a week of separation from the first school of babies, the breeding pair will spawn again. Remember, if you do this professionally you need the numbers if you want them to reproduce. You can’t be running out of fish, and this is the best way of doing it. now that the parents are out, we will have a much easier time netting the school. We will then transfer the school carefully and quickly into the grow out area. The grow out section has higher temperatures, around 86 to 88 degrees, and the reason for this is we want to get them to eat. Thank you very much for being here, we love interacting and hearing from you. We’re listening to you guys, and we’re grateful for all of the engagement So, keep the questions coming! We can’t keep making content like this unless we know what you want to know. Be sure to check out our website and all of our social media regularly, we add new content like this on a regular basis. Until next time, this is Gabe Posada straight from the Jack Wattley discuss hatchery.